There’s something about watching a juicy chunk of meat as it goes from pink to brown over a coal-fired grill. Restaurateur and chef Rahul Akerkar believes it takes us back to our ancestral instinct of hunting and cooking our meat over fire. 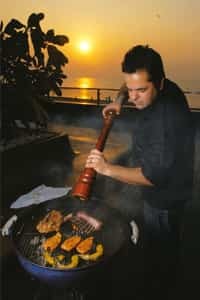 So his swanky new restaurant, Tote on the Turf, at Mahalaxmi, one of the very few places in Mumbai with a large al fresco dining area, had to have a live grill. Besides the leg of lamb, pork and chicken cooked over a grill, diners can enjoy wood-fired pizza made before their eyes. But Akerkar wants to add to the variety of meat being served at Tote and hopes to have a menu that will list ostrich, rabbit, venison and the much desired cut of steak, the T-bone, when the grill opens later this month. At West View, ITC Maratha’s grill room, you can identify a meat lover at a glance. With their backs turned to the salad buffet, they are the ones piling plates with juicy, rosy pink chunks of meat. The chef takes their plate to his gas-fired grill after seasoning the meat with a few herbs and spices, and it arrives at the table ready to eat. There is an option of the lava stone grill, which involves heating the stone in an oven for hours before it’s placed on your table with a piece of lamb on it. The meat cooks in front of your eyes in 3 minutes. Wild Fire at Crowne Plaza Today, Gurgaon, brings a concept similar to the Brazilian churrasco. The meat is grilled using a charcoal and gas grill and carved at the tables of diners. During the winter months, the restaurant is busier than usual. Located by the Juhu beach in Mumbai, Aurus recently decided to make the most of its surroundings with the Aurus Sundown on Sundays. It’s a potent combination of a gorgeous sunset, live performances and live grills. For the Sunday brunch at Four Seasons Hotel, Mumbai, the live grill has the choicest cuts of lamb imported from France, Ireland and Australia, guineafowl and pork loin from Holland and Italy, ostrich from South Africa and Japanese venison, both of which are available on request. “Ostrich and venison aren’t very popular with our Indian customers yet. We had to list guineafowl as chicken on our menu because people didn’t know what it was," says executive chef Giancarlo de Francesco, adding that the meats available locally aren’t juicy or fatty enough for grilling. “I like the meat to be cooked in its own juices without any extra oil or butter," says executive sous chef Kedar Bobde, Grand Hyatt, Mumbai. Although the price difference is about tenfold, most chefs don’t mind paying between Rs1,200 and Rs6,000 per kg of imported meat. Executive chef Mark Wilson, Intercontinental The Lalit, Mumbai, says lamb is his favourite meat for grills as it requires simple marinades. Chicken is bland and needs some herbs and spices, while pork lends itself well to liquor-based marinades. “Where I come from, barbecue is a national pastime. Most people won’t even use the kitchen for dinner," laughs the Australian. For those who enjoy barbecue as a social event, Wilson suggests buying the best quality meat one can find. In fact, he gets requests from customers to purchase meat from the hotel sometimes. Nachiket Shetye, chef and owner of East, a pan-Asian restaurant in Mumbai, says there are many kinds of grills easily available in the market—coal, electric, Teflon and gas grills. “Most important is to have the right safety equipment like apron, gloves, tongs and rods to move the coal. Have bread, sauces and some vegetables and corn to go with the meat and you’re set for a barbecue at home," he says. Thoroughly mix the chopped garlic, shallots, rosemary, thyme and Dijon mustard and spread over the rabbit loin. Add 100ml olive oil and cover the dish with cling film. Refrigerate for 24 hours. Cook over a charcoal grill for about 8-10 minutes and serve with bread and choice of grilled vegetables. Make ginger-garlic paste, add kasturi methi, nutmeg powder, salt, sugar, pepper and olive oil. Marinate the pork chops in this mixture and let stand for at least 3-4 hours. Grill the chops to order. For the sauce, sauté onion, carrot, celery in sunflower oil and add the white wine. Reduce the white wine by half and add the pork sausages and chicken stock. Reduce the liquid on a low flame till it is of sauce consistency. Finish with puréed mango achar. Adjust the seasoning and strain. For the green apple butter, boil the apple with water and sugar till soft. Purée it and season with salt, pepper and sugar. Slowly cook the purée and incorporate clarified butter. To serve, pour the achar jus around the chop and put a dollop of apple butter on top.